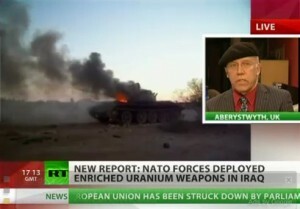 RT, Oct. 25, 2011 – The high court in London is to hear a case over the use of uranium-enhanced weapons by U.S.-led forces during the infamous Iraqi Battle of Fallujah in 2005. This, following a number of reports alleging their use was much more widespread than originally thought. RT talks to Christopher Busby, the co-author of two such reports and a visiting professor at the school of Biomedical Studies, the University of Ulster. This issue needs to be forced on to the pages and broadcasts of the mainstream media. Many politicians are, at the moment, trying to promote military action against Iran. If people in the West knew, beforehand, that our soldiers would be sent to Iran to – not only fight and die – but also irradiated by weapons deployed by the Western forces then I am sure that opposition to this war would be so great as to prevent it happening in the first place.